A squad of about 300 special Central Industrial Security Force commandos has taken over the security of a large Tata Steel manufacturing facility in coastal Odisha, making it the 7th private sector concern in the country to get armed cover by the paramilitary force to ward off terror threats. The CISF combat unit was inducted at the Kalinganagar-based facility of the steel giant earlier this week following approval of the Union Home Ministry. The squad will be functioning on a Quick Reaction Team pattern and the SUV-borne commandos will patrol the periphery and interiors of the facility armed with weapons like AK-47s and Glock pistols. "About 300 commandos led by a Deputy Commandant-rank officer have taken charge at the facility. They will be providing QRT cover on a 24X7 basis and they have been thoroughly trained in countering any security related challenge," CISF Inspector General (Eastern sector) R R Sahay told PTI. The Kalinganagar project is being established in two modules of three million tonnes each in Jajpur district of the state. This is only the seventh private sector deployment for the CISF after the force was empowered to take up duties in the non-government domain in the aftermath of the 2008 Mumbai terror attacks. Deployment of the highly-trained men of CISF at the facility assumes significance as the government has been very frugal over the years with agreeing to deploy these troops at private concerns. "Only those private sector concerns whose campuses and operations have a direct or a very close bearing on the economic security of the country are being okayed for a CISF security cover. The latest facility in Kalinganagar is one such entity," a senior official said. Other private sector projects where CISF is securing the campuses are the Electronics City Bengaluru, Infosys campuses in Bangalore, Mysore and Pune, Reliance Refinery and Petrochemicals in Jamnagar and the Coastal Gujarat Power Ltd in Mundra, which is a special purpose vehicle executed by Tata Power to generate 4,000 MW of energy for various states. The Tatas will bear the cost of the CISF deployment and will also provide logistics for jawans and officers like barracks and vehicles. 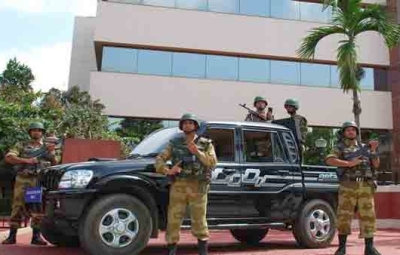 The CISF men are mandated to provide "counter-terrorist and anti-sabotage" duties and will not be responsible for "watch and ward" duties which will be provided by security guards employed at the campus by Tata Steel, the official said.